On our way to San Francisco I read off a sign with all the towns we were passing through. I remembered I had an aunt that lives near by. When I called her she was so excited, I couldn’t even get a word in. I introduced her to Gus and told her about our adventure camping. She fed us and let us get all cleaned up. It was a breath of fresh air to visit. I loved how happy she was to see us. When we arrived in San Francisco we were ready to see the city. We drop our stuff at a hostel and went to go take some photos in front of the Golden Gate Bridge. After dinner we made our way to the Arcade Museum. It was fun to actually play with the vintage games. I was so excited when I saw they had a photo booth. Gus said they are a curse for couples but I reassured him my parents took a ton when they were young. The next morning Gus woke up early (due to staying in a hostel.) He text me early in the morning and said, “I’m ready.” We were up so early nothing was open when we walked around town. We set out a quest to find china town. I had driven pass it many times but never bothered to walk the streets. Since he is in to marshal arts, this place was heaven for him. We ended up spending three hours shopping, and looking around. I finally got a t-shirt made that I’ve been talking about. “Go Indie.” It was a comment I made once on Facebook when a friend was complaining about how dumb movies are. 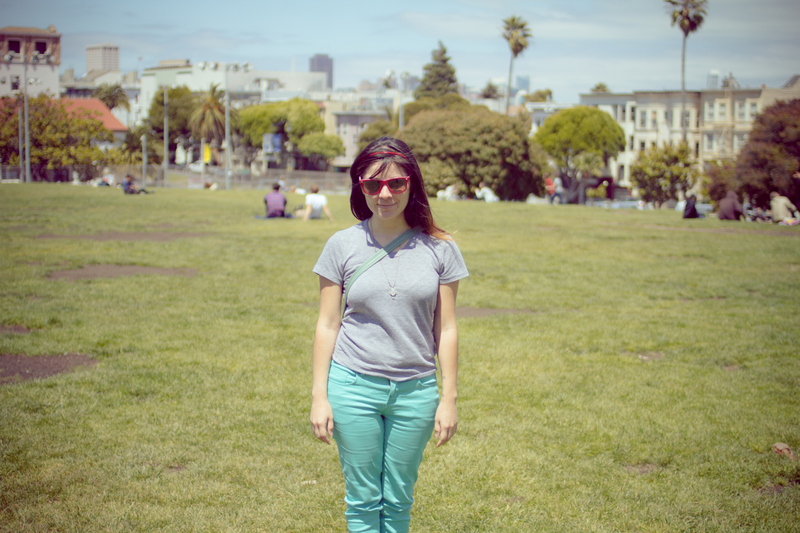 We made our way down to Dolores Park to get a coffee. It was kinda strange to find so many people sitting at the park on a Wednesday morning, it seemed like no one had anything to do. We found the atmosphere to be relaxing. 3pm hit and it was time for the long 10 hour drive to the magical land of Portland and Seattle!! !